20120330 - Up and L to the Dr. W/ Gma&paB. I headed into the office to get some things done. The boys were on their own and did really good; they even got their own lunches! 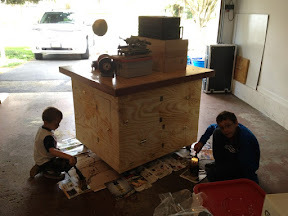 Finally out of the office and we transplanted a bush, D cut some wood for a project, I worked on some air piping I had that was leaking and then got the boys sealing the tool table. L home and GpaB doing good with his new knee! We ate some dinner and then L off to Zumba and the boys and I headed to the movies to see 'Wrath of the Titans', pretty good with lots of action. Stopped on the way home for Coke, OJ, doughnuts and French dip sandwiches.